There’s something so comfortable about a Reichert novel – like those fuzzy warm socks, and stretched out just the way you like it sweater, that simply engulfs you and demands you settle in and enjoy the ride. This novel is no different, even if the characters in this have more issues and struggles to work through than any of her previous stories. Told from the main character Gina’s point of view, with bits from her mother Lorraine and her fourteen year old daughter May, this is a story of expectations, grief, moving on and eventually finding a way to move forward as secrets are revealed and the past weighs on the future. 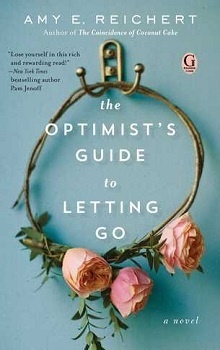 Now to my impressions of the book – it’s my favorite of Reichert’s to date: full of moments past and present, memories and struggles as the women try to reframe their lives in the now, after the griefs, secrets, resentments and struggles from their past. There are secrets galore, big secrets held closely in fear (from Lorraine) that made her a very judgmental, rigid and cold appearing woman. Secrets from Roza, Lorraine’s friend and nanny / auntie to Gina, Vicky and now May. Vicky’s marriage that ‘appears’ wonderful from the outside in: plenty of money, a nice house two hours from her mother, four kids with plenty of activities that leave Vicky alone, unable to communicate with her husband. Gina’s worry that Drew’s death have left May without her favorite parent, and her without her heart. Feeling the ‘push’ to move on from her neighbors and mother, yet unable to find the ‘right’ way to be, as she struggles with her own mother’s voice telling her to be ‘more like’ her sister, and seeming smug in the knowledge that she’d chosen the wrong man to marry. May’s own resentment of her mother for seeming to not care about her, her father’s death or even about anything she does – against the rules or not. All wrapped in their own griefs and questions, every issue has a root in the first big secret- Lorraine’s, and by extension, Roza’s complicity with that silence. With Lorraine’s stroke, the story starts to become one of discovery. A birth certificate and photograph of a man unknown to Gina and Vicky, Lorraine’s admission (to herself as her speech was affected greatly) that her daughters are strong and wonderful women, far more complete and successful than she was. Gina’s penchant for lists: the satisfaction of ticking off an item to be accomplished, the organization, the reliance on them as a sort of talisman to ‘get things done right’. And the food. OH the food – from Gina’s lovely grilled cheese and butter-drenched garlic bread (her junk food of choice) to May’s bacon-caramel brownies, coconut vegan brownies and her journal with thirty three new creations. Vicky’s discovery that her husband hasn’t time to listen, let alone interest, in what’s happening two hours north – and perhaps he never really did. It’s a book that is meant to be experienced. Do it this way. 3> Get snacks (you’ll want them) a drink and tissues handy. 6> Come back and thank me – trust me, you’ll want to.